Those of us in the northern part of states have been experiencing pretty bitter cold and snow. January and February are notorious for being the worst two months of winter in the Chicago area. The last two winters have been on the mild side and 2018 seems to want to bring back tradition and freeze us to the bone. Ryan Seacrest said close to midnight on the new year show that it was officially the coldest one in New York since they’d been doing the show. I felt kind of bad for him considering he’s used to warm southern California weather. For all you braving the bitter cold, we’ve got two sets of comforting, perfect for cold weather meals. Today we'll start with the first of four easy comfort food recipes. 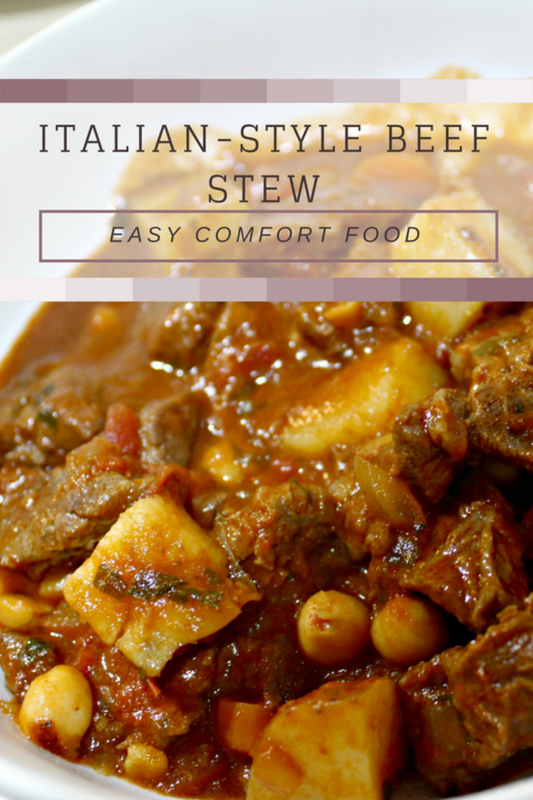 Nothing says comfort food like a hearty stew. This recipe puts an Italian twist on a favorite winter meal. It’s great for a weekend dinner or, if you have the ability to work from home, a weeknight dinner. It takes some time to prepare but most of the work is done in the pot while you’re off working or binging Netflix. It’s well worth it in the end. Serve with crusty bread, top with a sprinkle of Parmesan and you’re set. I like a chunkier stew with enough broth to soak up with the bread. If you like it closer to a soup consistency, add more broth. Note that the liquid will cook down while it simmers. The amount of liquid you begin with will decrease dramatically the longer it cooks. The potatoes, carrots and beef all soak up the liquid and some of it evaporates out. 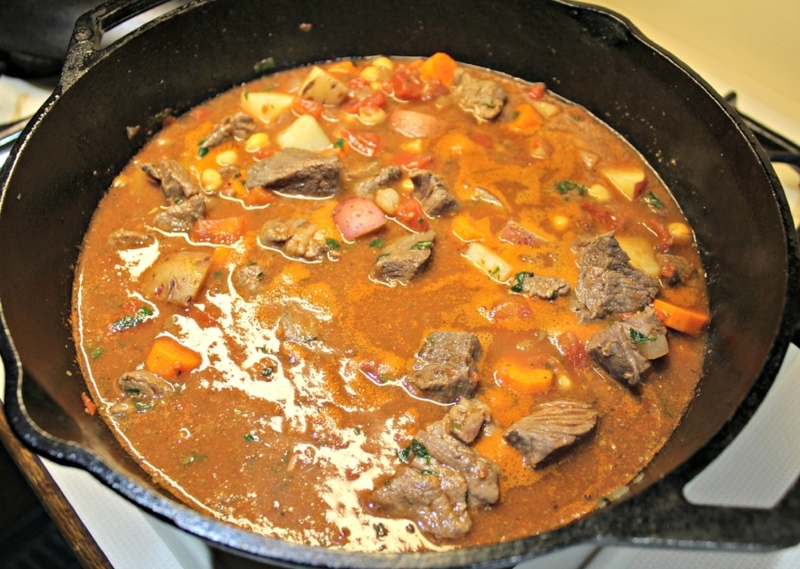 To get an edge on the chopping, buy stew meat at the store. It’s already cut into chunks and all that’s left to chop are the onion, carrots and potatoes. If stew meat isn’t available, you can also ask your butcher to cut the meat for you. If you bring home a whole roast, large 1-2 inch chunks will be good. Use a very sharp knife and be careful not to slice a finger on accident. 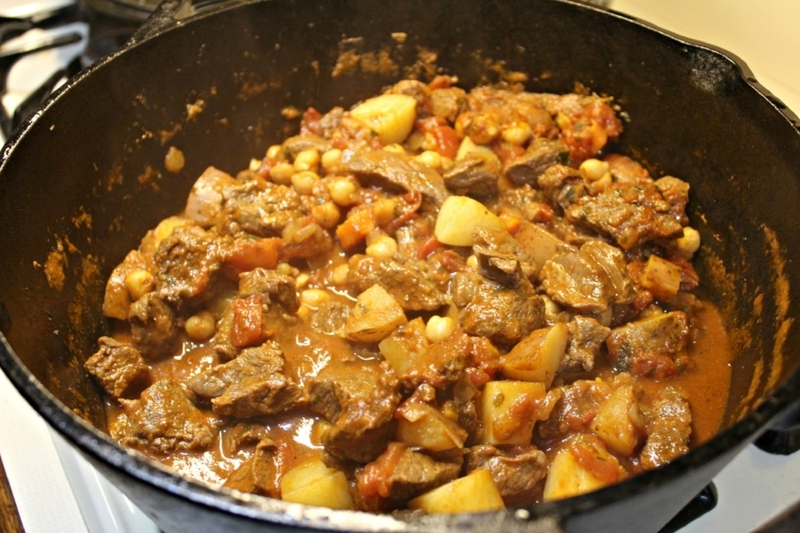 Before getting the stew going, brown the meat chunks in batches if necessary. You want each piece of meat to get a nice caramelization on each side. It will take a hot minute to go through three pounds of meat but it will add a greater depth of flavor in the end. It also creates these flavor bombs at the bottom of the pot that we deglaze with red wine later. Those flavor bombs are something you don’t want to miss out on by skipping the browning process. Let’s talk ingredients for a quick second. Onion, carrots and potatoes are pretty classic for any soup or stew. Chickpeas add a punch of protein and nutrition but also embrace the Italian-style theme. No Italian dish is complete without garlic and it’s perfect for this cold weather. Garlic is known to support the immune system helping prevent illnesses like the common cold and flu. It has anti-inflammatory properties and is also a great source of antioxidants. The same goes for onions so stop cutting them from your recipes if you can help it. Diced and crushed tomatoes are both used in this recipe. Tomatoes are the most familiar “Italian” ingredient. 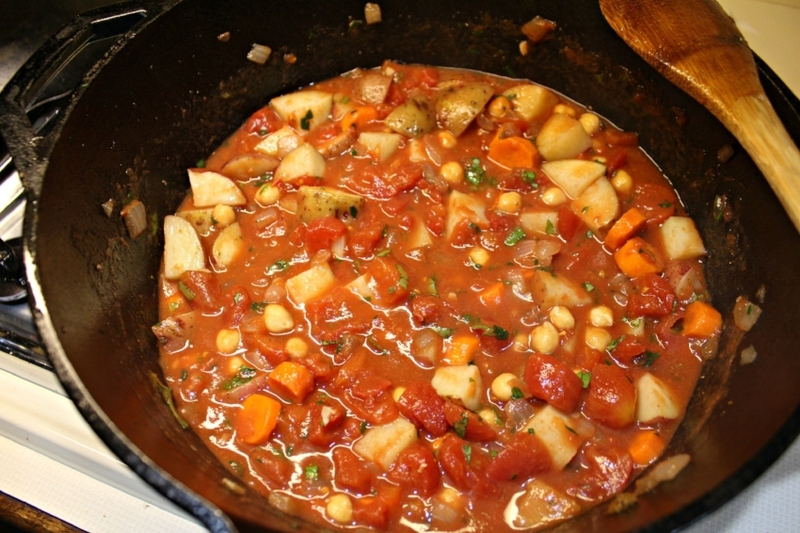 Diced tomatoes add chunkiness to the stew and the crushed tomatoes add flavor to the broth. 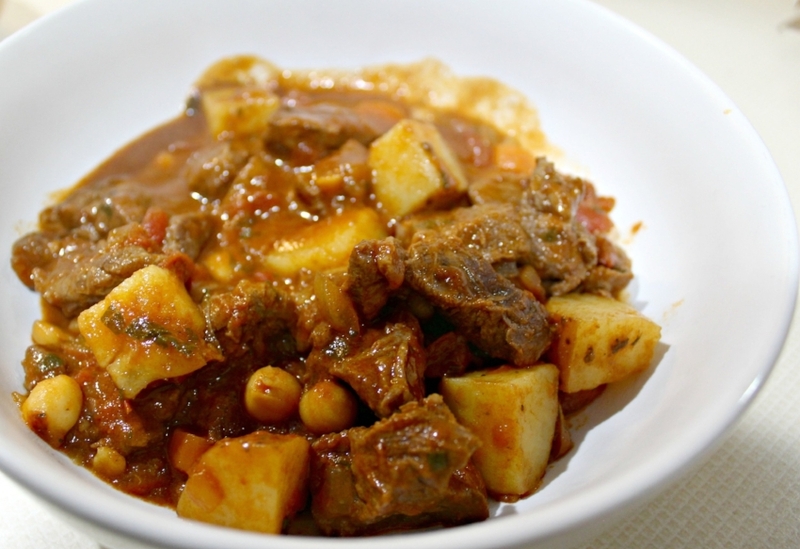 It gives the liquid a more “sauce” type flavor rather than a traditional stew gravy. Red wine is an ingredient that I love using in stews. It adds richness and lots of flavor. The red wine is what pushes this dish over the edge from comfort food to rich, hearty soul food. Parsley, rosemary, thyme and oregano are herbs used in classic Italian cooking. I use dry and fresh based on what’s available. I prefer fresh herbs but dried herbs pack a lot of flavor in a small amount so it can be more economical. Whichever you have on hand works fine. Remember to cut the measurements in half. Happy cooking! What’s the weather like where you live? Are you focusing on lighter meals for a holiday detox or are you still craving comforting dishes to warm you up? 1 - Heat the olive oil in a Dutch Oven over medium-high heat. Season the meat generously with salt and pepper and add to the pot. Cook until the meat has seared and developed a nice crust. Remove to a dish and set aside. 2 - Add the onions and garlic to the pot where the meat cooked. Cook a few minutes until tender. Add the carrots and potatoes. Stir 3-4 minutes until just starting to soften. Add the red wine to deglaze the pot, scraping the browned bits as you go. Add the chickpeas, diced and crushed tomatoes and stir together with the herbs. 3 - Add the meat back to the pot. Cover almost entirely with beef broth. Bring to a boil and let simmer 1-3 hours (however much time you have but no less than one hour and no longer than three). Serve with a side of crusty bread.